A key benefit of Microsoft Dynamics CRM is how easily and efficiently you can display data in charts and dashboards. A chart is a visual representation of filtered data, or a view. A dashboard is a collection of charts, giving users an at-a-glance snapshot of the key performance indicators they want to track. Much like a dashboard in a car, it provides information on what’s going on with various functions at that precise moment. Properly configured, charts and dashboards in CRM can be your organization’s go-to place for business intelligence. 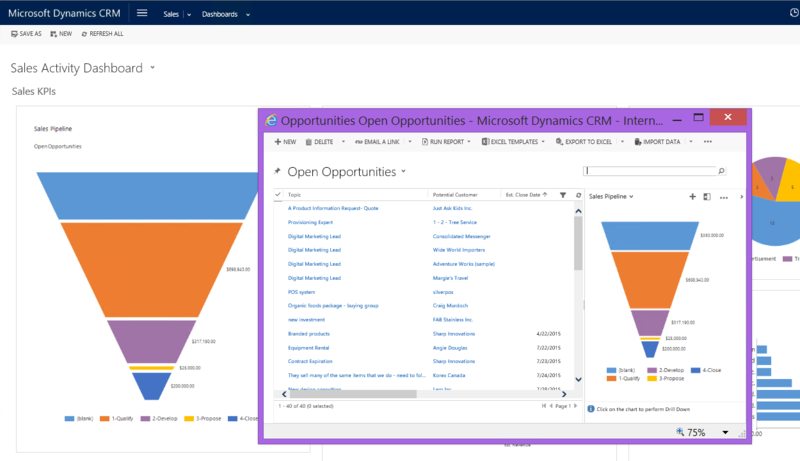 Charts and dashboards in Microsoft Dynamics CRM are not limited to information in the CRM proper; rather, CRM can connect to numerous other databases (ERP, accounting system, etc.) to bring in data from these diverse sources, to create a truly complete view of all key metrics. Below is an image of a typical Sales Activity Dashboard in Microsoft Dynamics CRM. Dashboards are by no means limited to sales activities: users can track absolutely any data that is important to their organization. This particular dashboard is comprised of five charts. Notice the variety of ways data can be displayed, including funnel, pie graph, bar graph and stack bar graph. Each chart can be customized to display data in the way individual users prefer. With just a few clicks, users can easily navigate from very high-level dashboard views to a very detailed look into the data. Would you like to learn more about charts and dashboards in Microsoft Dynamics CRM? Register for our free webinar on March 17. CRM expert Angelina Jacobs will take you through an informative session teaching you the basics of this key functionality of Microsoft Dynamics CRM.